The final share is here! This last share is a whopper that hopefully many folks will be able to use some of as part of Thanksgiving celebrations. Cippolini onions are milder and sweeter than your average yellow onion and are great for roasting and caramelizing. More info here. 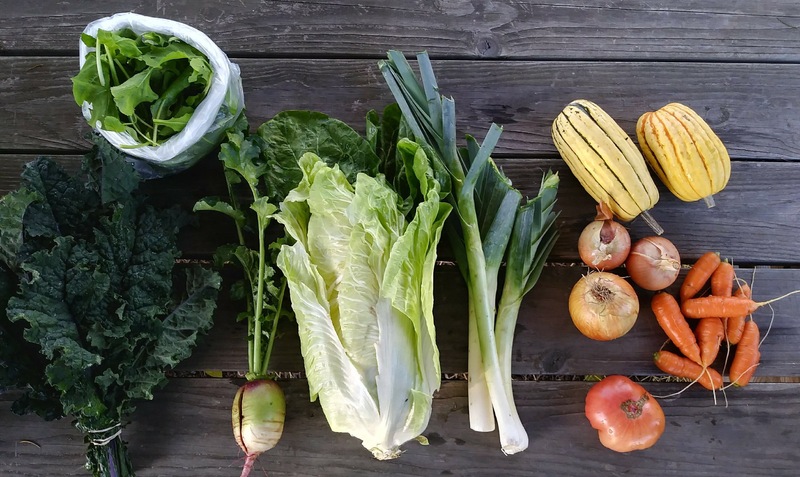 The turnip in this week’s share is called “Wonnegold” and is from Adaptive Seeds. It’s a lovely golden turnip with a bit of a radish-y flavor. Savoy cabbage is new in the share this week. You could make a slaw or kraut with the turnips. Or cook it along with the collards or kale for a big mess of greens. Spinach is another item we haven’t seen for a while. It’s flavor is nice after some of the cold nights that we’ve had this fall, which bring out the sweetness in almost all the vegetables still in the field. I’m glad that our carrots lasted until this final share. We had just enough to keep them going in each share this fall. It was nice to balance out the sad lack of carrots we had in the summer. A lot of our crops seemed to be just the right amount actually. We are pretty much giving out everything that’s left this week! Thanks to everyone who’s been involved in the farm this year! All the CSA members, all the Cully Farmers Market folks, our amazing crew – Josh, Martin, Matt Ives, Sam, Mark! None of this is possible without all of you! All the best this winter to all of you. Keep in touch, and eat well. 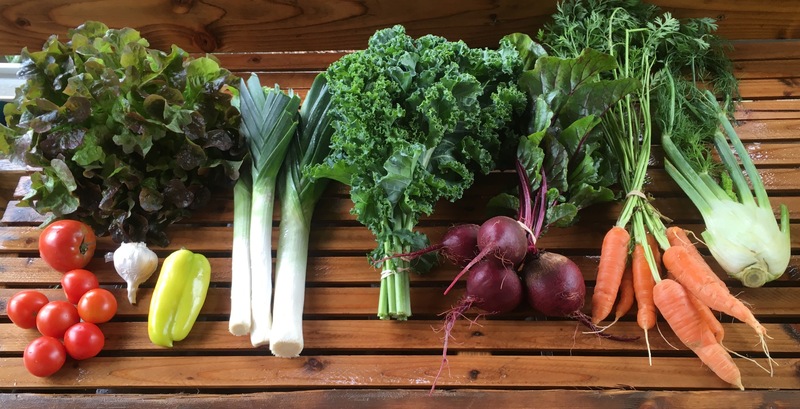 This second to last CSA share is a big share as there is no share pick-up next week. The final share will be the week after that, which should also be a large share like this. German Butterball potatoes are esteemed for their excellent flavor and texture. They are versatile and do well baked, mashed, fried, and roasted. Celeriac (aka celery root) is a crazy looking vegetable very closely related to celery (the tops look very similar), but bred for its edible root. It can be eaten raw or cooked and there is more info & preparation ideas at the bottom of this post (and as always check cookwithwhatyouhave.com). Escarole is a kind of chicory so see last week’s post on chicories for details. Some of the escarole heads have a bit of “tip-burn” on the leaf edges. If you find it, just pull off those parts and use the rest of the leaves. Parsnips get sweeter when cooked – try them roasted with other root veggies, mashed with potatoes, or in a pureed soup with other veggies. In the arugula planting there was a weed that looked very similar to arugula. We tried to get it all out but it’s possible you may find a little bit of it in there – it’s not poisonous or anything, just doesn’t taste like much. The colder weather brings a sweetness to almost every vegetable that’s still being harvested from the field. Do you notice the difference? I definitely taste it in the carrots, parsley, and arugula. Cold-tolerant plants make a sort of anti-freeze that involves sugars when the weather turns cold, and this is responsible for the taste difference. If I were looking to use a lot of these veggies quickly and easily I’d do a roasted root dish (can add any winter squash from last week as well – see recipe below), or a soup that could include any or all of these – leeks, shallots, garlic, potatoes, celeriac, carrots, and parsnips. Celeriac is a pale-yellow, dense, knobby (some say even ugly) root; it’s roughly the size and shape of a grapefruit. Like most root vegetables, celeriac is excellent in stews and soups, and makes a perfect a gratin — with or without the addition of potato. It also makes an amazingly silky purée. Left raw, it can be grated into salads, as is the case in its most well-known dish, céléri remoulade. It requires a fair amount of peeling to reveal its creamy-colored flesh. To peel, simply lop off the top and bottom so that it sits flat on your cutting board and work your knife down the sides to remove the knobs and roots. Occasionally you may have to take out a few rougher spots with a sturdy peeler. Use the flesh right away or put it in acidulated water to prevent discoloration. 2. Place all of the cubed veggies in a 9-by-13-inch baking pan (you should have about 8 cups). 3. Mix the olive oil, soy sauce, and maple syrup. Add the salt and pepper, as well as the thyme and ginger. Season according to your mood. 4. Cover the pan with aluminum foil and bake for 40 to 55 minutes, depending on the size of the vegetable cubes. The vegetables will be tender, and a fork should easily pierce the largest vegetable cube in the pan. Be careful when you’re removing the foil so as not to get a steam burn. Chicories represent a broad spectrum of salad crops related to lettuce but are more cold tolerant and have a bit more bitter edge to them. Among them are radicchio, escarole, frisee, and sugarloaf (this week’s featured chicory). As cold temperatures approach, chicories like many crops sweeten up a bit. We did get a light frost last week so I hope the chicories have a bit more sweetness to them. Either way it’s time to eat them, so how does one approach that? I like to slice the sugarloaf in half lengthwise, rub it with olive oil and salt, and throw it on the grill. Cooking brings out the sweetness! Also new this week is delicata winter squash, possibly my favorite because it’s so easy to use. Like any winter squash you can roast it, but with delicata the skin is delicate enough to be edible as well, so you can also slice it and saute it in a pan. Nice for when you don’t feel like turning on your oven! But if you are turning on your oven, go ahead and roast your leeks, onions, and carrots in there as well. Watermelon radish has a beautiful red, mild center, but make sure you peel that skin off unless you like spicy tough things! Speaking of spicy, the arugula this week has a bit of spice to it, just so you know. In the field news this week, we have plowed up a new spot for garlic in a nearby neighbor’s big backyard. We have garlic rust very bad in the soil at the farm so garlic just doesn’t do well there at all. I try to move it around the neighborhood each year instead. Garlic will be planted soon – maybe next week! I got some beautiful seed garlic from Whistling Duck Farm in southern Oregon. Josh and Martin pulled most of the irrigation out of the field yesterday as well. Now the only field clean-up work left really is taking down a few more trellises, and getting a bit more cover crop into beds that are open. Our cereal rye & vetch mix doesn’t germinate very well after mid-October but I have some annual ryegrass and phacelia that supposedly germinates well any time of year, so I’m excited to try that as a cover crop mix. It’s the end of summer for real now folks, the tomatoes are coming down. 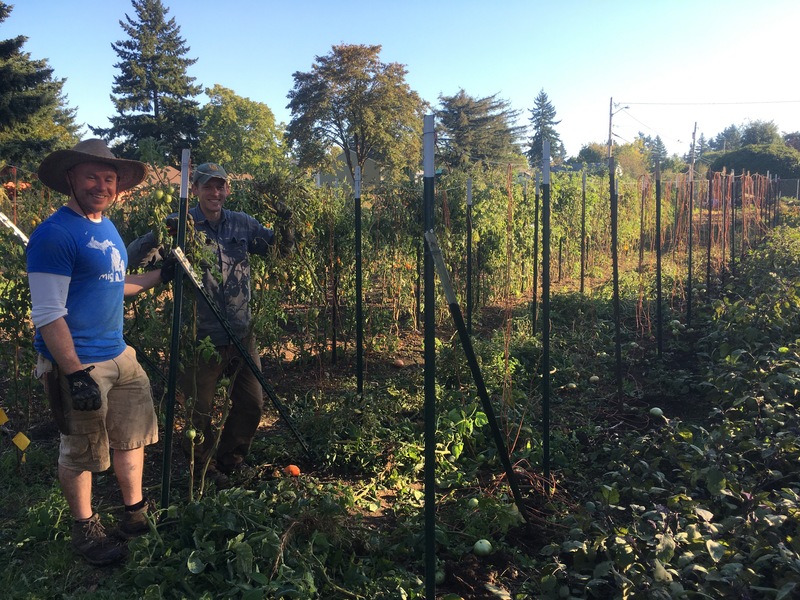 After harvesting the good-looking green tomatoes, Matt and Sam removed the plants from the trellis string. After this photo they took down the trellises as well, so the field is looking quite different. Though we could have left them in, tomatoes ripen very poorly in this kind of weather and their flavor is also not very good. However, the green tomatoes are delicious. Stay tuned to the end of this blog post for some green tomato ideas. I haven’t decided whether to leave the tomato plant debris as a mulch on these beds for the winter, or chop them up with the mower, work them into the soil, and seed these beds with cover crop. According to Wood Prairie Farm where we bought some of our seed potatoes this year, the “Rose Gold” potato is “the best of the red-skinned golden-fleshed potatoes. A mildly dry potato that is perfect baked, steamed or in creamy soups. Unsurpassed taste.” There is quite a bit of damage on them so you will have to cut out the bad spots. Green tomatoes: There are a lot of things you can do with these including frying them or making salsa or relish. Recipes at the end of the post. The red tomatoes are from the hoophouse. This variety “Matina” is small but I think has good flavor and seems really productive. The “Bora King” radish has a spicy skin but the interior seems mild. This is our first year growing it. Would be good pickled, kim chi, slaw, or salad. The leaves are edible too, though you may want to pickle or cook them as they’re a little hairy! • Parsnips are a delicacy when prepared with cheese, butter, and cream in concoctions like vichyssoise, au gratins, and creamy soups. • Parsnips make an interesting substitute for potatoes. Try them deep-fried, mashed, or baked; in soups and stews; or on their own as a side dish. • The light sweetness of parsnips makes them dynamite with fruits like apples, oranges, cranberries, dates, and figs. • Baking and roasting caramelize the parsnip’s natural sugars, bringing out its delicate flavors gloriously. • Use parsnips as a filling for pasties and pies, along with other root vegetables such as carrots and potatoes. • Try parsnips as a surprise vegetable in curries; the mild, sweet flavor is a nice foil for the spice. • Coconut, ginger, honey, and parsnips are an unexpectedly delicious combination—try them as a cake, as a mashed or whole vegetable side dish, or as a creamy soup. • Parsnips have an affinity for the sweet spices we associate with fall and winter desserts: cinnamon, cloves, nutmeg, allspice. The peppers are slowing way way down and we are picking them quite a bit more green. Using them immediately they will taste more like green peppers but they will continue to ripen up on your kitchen counter. The white-ish “gypsy” peppers actually taste really nice at the white/yellow stage before they turn orange. Fennel is making its second and last appearance of the season. Tomatoes are phasing out and next week there will most likely be a haul of green tomatoes for everyone. First leeks of the season are here, and they will be featured probably twice again before the end of the season. 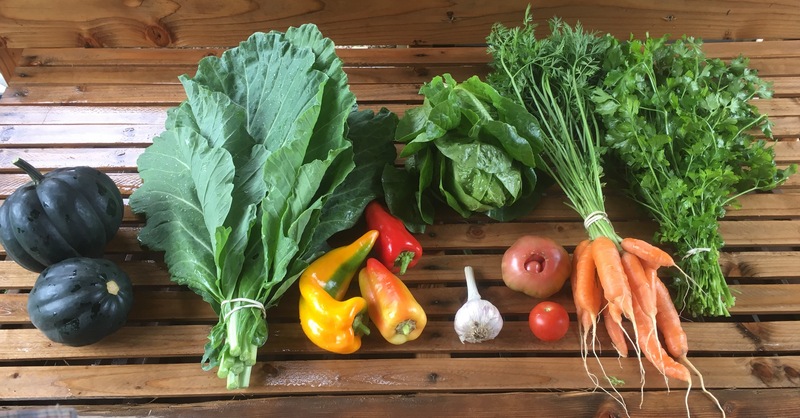 We’ll continue to have lettuce a time or two more this season, and there will also be some chicory salad greens such as “sugarloaf,” “escarole,” and “radicchio.” Arugula and spinach are also in the plans as far as greenery. Carrots will continue and have started to get some real girth on some of them. The rye and vetch cover crop mix is starting to come up nicely in some spots. The sudan & clover cover crop mix we planted in the summer is looking very nice right now. See you next week, and enjoy these beautiful fall days. Peppers and tomatoes are still coming, but slowly. At some point we will call it quits on the tomatoes and hand out a bunch of green tomatoes in the share, but for now with more sun in the forecast, we will keep harvesting the reddish ones. U-pick cherry tomatoes are still available at the farm, though in a bit less supply. The u-pick romano beans are done for the season. There are still u-pick herbs and flowers for now. Our potato variety this week is “Amarosa,” a really special fingerling variety that has red skin and red flesh. Unfortunately the wire worms really got after this variety so you will find you’ll need to do a bit of trimming off parts. We will continue to have carrots each week for a bit still. The eggplant is probably done after this week. We took out the cucumber and bean trellises on Monday and started to get those beds ready for cover crop. We are planting a mix of cereal rye and vetch right now which will keep the soil covered with growing plants through the winter and provide organic matter and nitrogen in the spring when they are mowed and incorporated. Other clean-up tasks right now involve rolling up our irrigation lines (drip tape) and some weeding chores. It’s starting to feel like the workload is slowing a bit so we may have some later starts and/or earlier ending workdays soon, an exciting thought for the summer-weary farmers. Yes carrots are back! Hooray! We should have them for a good while now, probably not every week, but hopefully most weeks from now until the end of the share in mid-November. Winter squash makes its very first appearance in the share this week. This fall, winter and spring staple food comes in many varieties, shapes, and colors. Some kinds store better than others and some are better eaten sooner and some later. Acorn squash does not store as well as many other types and its flavor tends to be better eaten on the earlier side (closer to harvest, which is about now). So that is why it is the first winter squash in the share. All that said, it should store for you well on the counter for at least 4 weeks if you need it to. Next in line will be ‘delicata’ coming into the share in about 3 weeks. At the bottom of this post I’ll put in some more info about winter squash preparation ideas. In the past I’ve let potatoes store themselves in the ground where they’ve grown and dug them as I needed them. This season we’re doing things differently. We dug all of the potatoes that were still in the ground yesterday. They were being nibbled by some farm critters and also some soil dwelling insects called wire-worms. Unfortunately you will probably see some wire-worm damage in some of the potatoes that go out this fall. In looking into them, I think the main thing that we need to do differently in the future is harvest the potatoes as soon as they are ready and get them into storage, as the worms do the worst damage once the potatoes are fully sized up. Lessons learned every year! For this year, if you find damage, just cut it out and use the part of the potato that looks good. Potatoes need cool, dark, moist storage and I’m working on getting them into a suitable place this week. They’ll be distributed about 3 more times between now and the end of the CSA. Acorn squash, with its distinctive shape and dark-green skin, has yellow flesh that is mildly sweet and slightly nutty in flavor. A smallish squash that measures 5 to 8 inches long, it will keep in a cool, dark, well-ventilated place for months. Remember, however, that the Acorn is an early-ripening squash, so it will not last through the winter. Baking and roasting are the best ways to prepare winter squash, as these methods caramelize their natural sugars and concentrate their flavors. To bake whole squash, follow the directions above for washing, trimming, and pricking. Place the squash on a baking sheet or pan. If it is too big, you may halve or quarter it and place the pieces on the pan, cut sides down. Most squashes weighing 1 to 1½ pounds will take about 45 minutes in a 350°F to 375°F oven; 3-pounders require 1½ to 2 hours. In the last third of the cooking time, check constantly for doneness by inserting the point of a sharp knife into the center of the squash. If the knife blade passes through easily with no resistance, then the squash is done. Extract the seeds and surrounding stringy pulp, and scoop out the flesh into another container. Season to taste and reheat if necessary. Or you can peel and cube squashes such as butternut, then toss the cubes with olive oil, salt, and pepper. Roast at 385°F, turning once, until caramelized and tender. Boil or mash winter squash just as you would potatoes. Add peeled squash cubes to your favorite soups, stews, beans, gratins, and vegetable ragouts. Steam cubes of winter squash and dress with olive oil, garlic, tamari, and ginger for a savory dish, or with apples and ginger for a sweeter dish. Bake squash, cut into halves, and stuff with seasoned meat, rice, breadcrumbs, or a favorite stir-fry recipe. Make shredded strands of spaghetti squash into an au gratin, with butter and cheese. Very tender, sweet winter squashes can be finely shredded to make an unusual slaw, along with raisins, mayonnaise, vinegar, cream, and sugar. Incorporate mashed or finely shredded squash into pancakes, much like potato pancakes, or deep-fry like hash browns. Substitute sweet-flavored winter squash in any recipe calling for pumpkin. Dress cooked winter squash with butter and herbs, a cream sauce, cheese sauce, maple syrup and nuts, marinara sauce, or stewed fruit. Use cooked, mashed squash in breads (especially cornbread), muffins, custards, and pies. Be sure to compensate in the recipe for the squash’s extra moisture. Peel and cube butternut squash, then toss the cubes with olive oil, salt, and pepper. Roast at 385°F, turning once, until caramelized and tender. Serve as is or toss the cubes with sautéed chard, kale, or roasted bell pepper strips. Source Note: This delicious, colorful, stuffed winter squash dish—bursting with nuts, plenty of herbs, and dried fruit—is hearty enough to be a main course. It’s also an excellent accompaniment to golden, roasted chicken or grilled pork or lamb chops. Oil a baking dish that can snugly fit the squash halves. Place the squash, flesh side down, in the dish and pour in 2 cups of water. Bake until it is fork-tender, about 20 minutes. Meanwhile, heat the butter or oil in a frying pan and sauté the onions until they turn translucent. Add the celery, walnuts, sunflower seeds, and garlic. Cook over low heat until the nuts are browned. Add the sage, thyme, and marjoram. Stir in the breadcrumbs, lemon juice, salt, pepper, and raisins; then cook over low heat for 5 to 8 minutes. Remove from the pan and stir in the cheese. Lower the oven temperature to 350°F. Pack the stuffing into the squash cavities and cover with aluminum foil. Bake, flesh side up, for 25 minutes. Then uncover and cook for 5 to 8 minutes longer to brown.